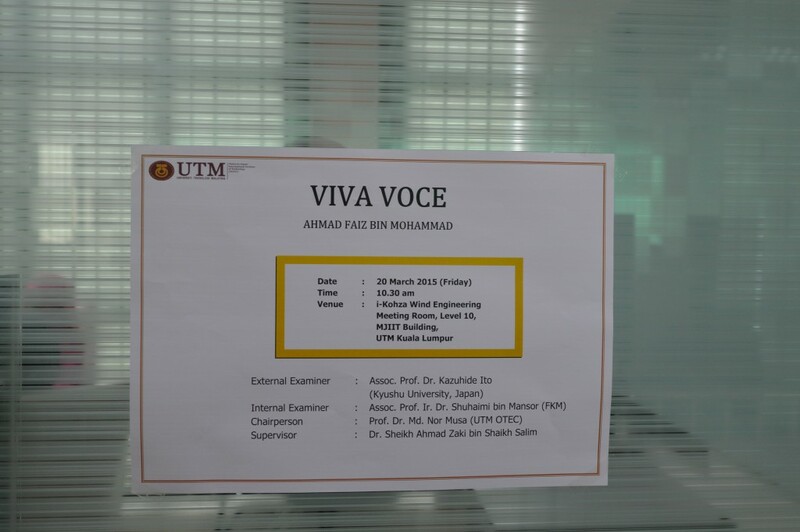 On 20th March 2015, Wind Engineering for (Urban, Artificial, Man-Made) Environment Laboratory undergone its first Master student’s Viva Voce session for Ahmad Faiz bin Mohammad. The research title is Numerical Simulation of Wind Pressure Distribution in Urban Buildings of Random Staggered Arrays. The session was held at iKohza Wind Engineering Meeting Room with Prof. Dr. Md. Nor Musa as the Chairperson, Assoc. Prof. Ir. Dr. Shuhaimi bin Mansor as the Internal Examiner and Assoc. Prof. Dr. Kazuhide Ito from Kyushu University, Japan as the External Examiner. Overall, the session went well with only minor adjustment to the thesis need to done for Faiz to successfully graduated.